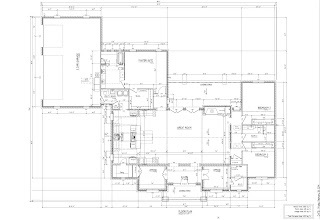 Plan Sets (also known as construction documents or CD's) are the actual published drawings and specifications that are used to build your house. A plan set can consist of 1 or more pages -depending on the size, complexity and scope of the project. I do not provide printing services because with the advent of PDF I find that printing companies can provide that service better. There are literally thousands of individual components that make a house. In my experience most people do not want to take the time to select everything in advance and would consider that to be a pretty daunting project in itself. The norm is to make selections as needed during construction. The good side to that approach is that it makes it easier to get started. The bad side is that the lack of good advanced planning may cause problems. These problems are usually minor and even with good advanced planning it is certainly possible to have unexpected complications. For example you receive the wrong specifications, the specifications change or the item becomes unavailable. Generally each builder will have their own standards but all builders in a given geographic area tend to be pretty similar and all houses are usually constructed in a similar way. The subcontractors (Plumbers, Electricians, Framers, etc..) likewise become familiar with local codes and building practices and can perform their specialty without a great amount of plan detail. While a plan set full of specs and details can look very impressive and thorough it does not necessarily result in a better house. Most of the details are simply stock details that represent typical construction and building codes which are already known. When the builder or subcontractor is presented with a sheet of details then they have to spend time going through all the details trying to find any which deviates from their standard practices. Your builder should have the applicable International Residential Code for your area and be able to understand it. Here in Brazos County we currently use the IRC 2015 edition. For about 150 dollars a code book addresses all details questions and possible building methods. There are also some handy books that address the most common areas of concern like - Residential Code Essentials, 2015 edition. My experience is that it is better to only specify what is not standard. Simpler is usually better. Plans that are uncluttered tend to be easier to read. If you are trying to have someone build your house that knows nothing about houses or frame your house that does not know how to frame then I think that is problematic. 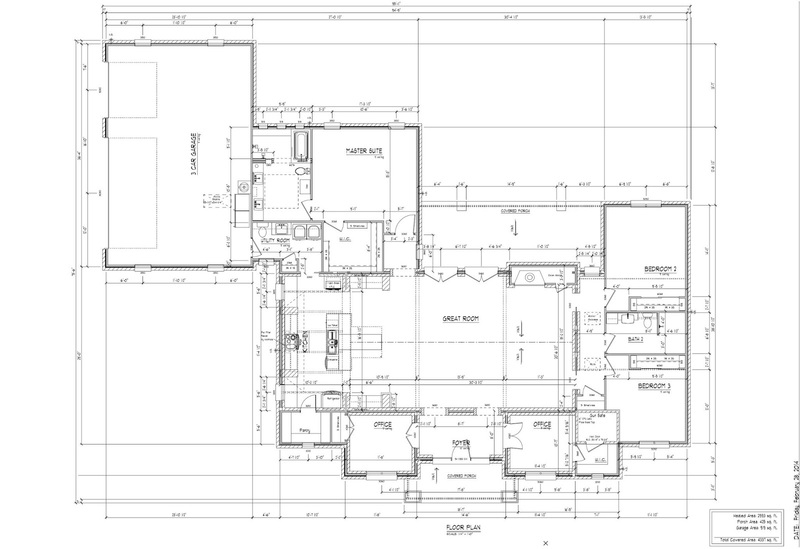 In this case complete framing plans and construction details and specifications may help. When I draw a plan it is generally generic since most people at this early stage have not actually made any selections. For example I may show a window as being a 3050 (meaning 3'-0"w x 5'-0"h) but you may choose to use a manufacturer that uses slightly different dimensions. The builder would then substitute the actual window rough-in requirements that most closely match the generic openings shown. Generally speaking the more unusual an item is the more advanced planning is required. Most projects that I work on require between 3 to 6 pages. This is the minimum required to build a simple house on a large rural property in my area where there are very few regulations to follow. A digital 3d model of the Exterior only (no interiors) colors and finishes may not exactly match actual built finishes but if you say you want a galvalume metal roof and beige trim or show me a particular stone you want to use I will try to get close. Then we would need to determine what other plans you need or desire. Literally it is possible to design and account for every single item that is used to build a house the same way Boeing designs jetliners. 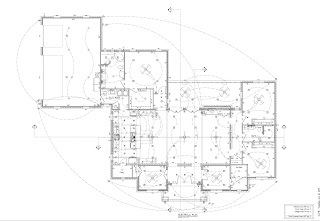 Sometimes I will draw a foundation plan based on typical building practices and codes and sometimes an Engineer is required by code or Subdivision rules. 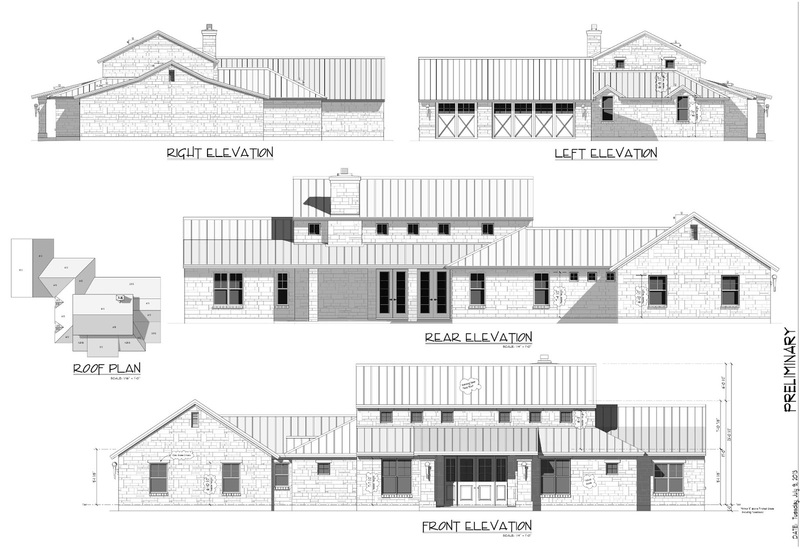 Typically the larger the houses the more likely it is to have an Engineer do the design. In that case I can provide them with a CAD digital standard drawing. Generally you want a frame carpenter that knows building codes and has a good understanding of how structures work. This is not always the case. Here in Texas frame carpenters are not licensed and there is no standard training. I have witnessed framers that have an extremely poor understanding of loads. Load is the weight of the roof or the force of wind for example. The load of the roof has to be transmitted to the foundation and the house has to resist racking in strong winds. The good thing is that most houses are relatively simple and standard practices and building codes tend to have a high safety margin. I do not specify structural elements like beams. While I understand and will draw where a beam is needed I feel that it is better left to a professional engineer or a technician who specializes in designing with specific beam types. Roof and or Floor Trusses are other components which are usually designed by specialists. If needed I can coordinate with these other service providers. Unless requested I leave joist and rafter sizing and layout to the Frame Carpenter and Builder to decide. As well minor details like how the soffit is built and window header heights, materials, etc. that tend to vary a little bit by individual preference. If you want a specific detail that is not standard for our area (like exposed rafter tails) then we can include that in the plan. Think of a slice through the house which shows the structure in a vertical plane. 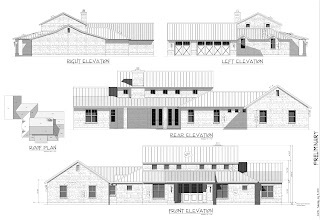 Like elevations but it will also show the interior structure. One or more may be needed for permits or just to clarify the plan. Typically I provide them as needed. Generally the Plumber will create their own plan that they use to connect all of the fixtures. -Often they simply draw it on top of the floorplan. If you want a copy of that plan then you can work with the plumber to get one. This is also usually the case for HVAC as well. A typical electric plan is pretty generic. Usually I do not know where the service line is coming from or whether it is overhead or underground or exactly what equipment requirements are going to be because these things have usually not been determined at the early planning stage. The electric plan should give the electrician a good idea of what you want but I feel that it is best to walk the house with the electrician immediately before they start the rough in to set minor details. For example you plan to mount a TV high on a wall or you want to add an outlet at a specific location. I started out as a trim and cabinet carpenter at that time most cabinets where build on the job site. We would layout the cabinet design with the homeowners by drawing them on the walls before we started to build them. These days cabinets are often built in a shop (like Kent Moore Cabinets) and these companies have their own software to design their product which will produce a plan and 3d views. 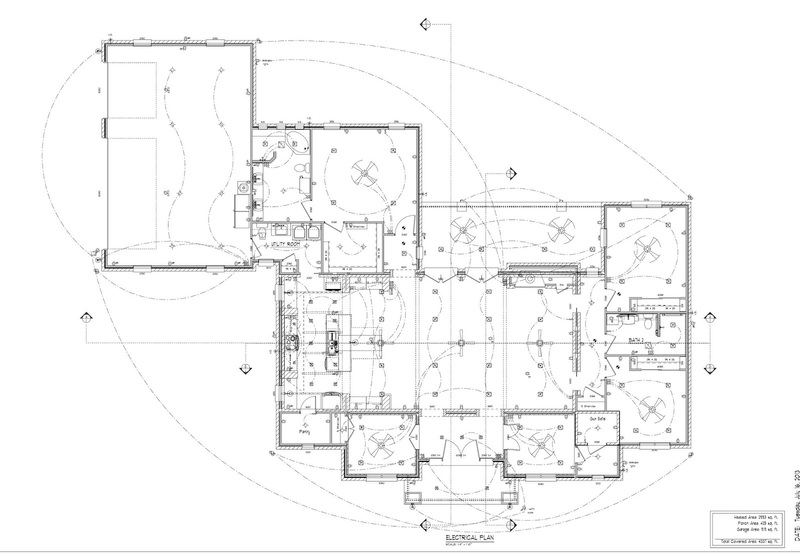 The only important thing that a plan needs to show is the location of the sink and appliances. But if you would like cabinet elevations or would like to see your kitchen in 3d I can provide that service or coordinate with a manufacturer. Most often these are only done for cabinet walls or other walls of special interest where there is some detail that need to be shown/designed. Some site may require planed drainage to be shown on the site plan. I generally do not visit the site and so do not have the information to show this but I can provide this or this may be added to the site plan by the builder or landscape subcontractor. Sometimes a landscaper or Landscape Architect will create a landscape plan. Or for example if you are going to build a swimming pool the pool company would provide their own plans -same for yard irrigation, etc.. I can provide this, you and or the builder can provide it and there are also services which specialize in filling out this report. I can also provide full modeling of the interior. Often there are models of actual products like kitchen appliances, bath fixtures, etc. which can be used.